God does not lightly tell us in His word of the damage sin can do, for the soul that sins it shall die! Through His loving mercy for mankind God has sent His Son Jesus for the salvation of man. We do not answer for the sin of another, and only the life of the righteous will be saved. (Ezekiel 18:20-24). The soul that sinneth, it shall die. 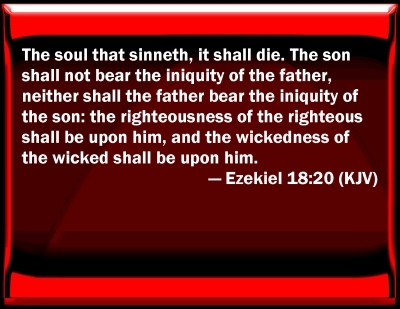 The son shall not bear the iniquity of the father, neither shall the father bear the iniquity of the son: the righteousness of the righteous shall be upon him, and the wickedness of the wicked shall be upon him. But if the wicked will turn from all his sins that he hath committed, and keep all my statutes, and do that which is lawful and right, he shall surely live, he shall not die. All his transgressions that he hath committed, they shall not be mentioned unto him: in his righteousness that he hath done he shall live. Have I any pleasure at all that the wicked should die? saith the Lord God: and not that he should return from his ways, and live? But when the righteous turneth away from his righteousness, and committeth iniquity, and doeth according to all the abominations that the wicked man doeth, shall he live? All his righteousness that he hath done shall not be mentioned: in his trespass that he hath trespassed, and in his sin that he hath sinned, in them shall he die. God does not show favoritism to anyone and He is not a respecter of persons. His hope is that we choose His will over our own, and therefore gain eternal life by obeying Him. (Romans 2:7-13). To them who by patient continuance in well doing seek for glory and honour and immortality, eternal life: But unto them that are contentious, and do not obey the truth, but obey unrighteousness, indignation and wrath, Tribulation and anguish, upon every soul of man that doeth evil, of the Jew first, and also of the Gentile; But glory, honour, and peace, to every man that worketh good, to the Jew first, and also to the Gentile: For there is no respect of persons with God. For as many as have sinned without law shall also perish without law: and as many as have sinned in the law shall be judged by the law; (For not the hearers of the law are just before God, but the doers of the law shall be justified. The greatest gift we have been given is eternal life that is found through Jesus Christ our Lord. Death of our soul is a grave mistake if we remain the servants of sin and the weakness of the flesh keeps us from the love of God and His grace. No one is promised tomorrow, but repentance of our sin gives us hope our soul will not perish but live forevermore! (Romans 6:16-23). Know ye not, that to whom ye yield yourselves servants to obey, his servants ye are to whom ye obey; whether of sin unto death, or of obedience unto righteousness? But God be thanked, that ye were the servants of sin, but ye have obeyed from the heart that form of doctrine which was delivered you. Being then made free from sin, ye became the servants of righteousness. I speak after the manner of men because of the infirmity of your flesh: for as ye have yielded your members servants to uncleanness and to iniquity unto iniquity; even so now yield your members servants to righteousness unto holiness. For when ye were the servants of sin, ye were free from righteousness. What fruit had ye then in those things whereof ye are now ashamed? for the end of those things is death. But now being made free from sin, and become servants to God, ye have your fruit unto holiness, and the end everlasting life. For the wages of sin is death; but the gift of God is eternal life through Jesus Christ our Lord.